I’m the CEO of a large integrated health care system and my three millennial children and their spouses don’t want to use my services the way they are delivered today. They have food shipped to their homes. They don’t think about going to a shopping mall. They don’t shop at big-box stores. They wouldn’t even consider buying something without checking the reviews online. For them, it’s about convenience, access, value. And that is why health care needs to be transformed. At OSF HealthCare, we want to lead the transformation. It’s part of our Vision – we are one OSF Ministry transforming health care to improve the lives of those we serve. We think of it as a mind shift. We have to recognize that transformation of health care is not only inevitable, but necessary. It’s necessary because our patients’ expectations are changing and transforming. Bob Sehring, CEO of OSF HealthCare. Consumers today are more engaged. They’re thinking about costs. They’re asking questions. We have to ask ourselves if we are creating more friction than not for them during their experiences with us. It’s about patient satisfaction. It’s better understanding our patients and their needs and how we can better meet them where they are. We also have to look at trends in the health care industry today and how those trends are impacting us. There are organizations coming together to disrupt how health care is delivered today. They truly believe health care is ripe for disruption because there are opportunities to take that friction out – the friction isn’t necessarily about the service they received, but everything wrapped around it. Take Amazon for example. Amazon started 21 years ago as a place to buy books online, and look what it is today. Amazon understands their customers – our patients – likely better than we do. Amazon uses data to predict their customers’ behaviors and needs. So how do we prepare for a disruption such as that? We need to perform, grow and innovate. But how do we do that? First, we need to be agile, yet deliberate. Those companies that are innovating and looking to disrupt health care are agile. We need to think differently about the care that is being delivered and find new ways to do that, then test it and pilot it and spread is across the Ministry. This doesn’t mean we become careless or that less planning goes into creating solutions, it just means we need to respond and roll those solutions out much more quickly and not have a committee looking at it for two years. The comment, “That’s the way we’ve always done it,” just makes me bristle. That just can’t be the answer. We need to think about things from a different perspective. It’s about being curious, not about doing things we’ve always done and having that be good enough. It’s asking ourselves, “Is what we’re doing the best way to do it?” And to keep asking ourselves that question, over and over. Lastly, we need to be critical. We all have many opportunities to improve. We don’t lack for metrics or benchmarks or opportunities to compare ourselves to others. But if we’re doing the same things over and over again and expecting a different outcome, that’s truly the definition of insanity. We need to take a fresh look every day at what we do and how we do it and be appropriately critical. So what is it we need from our patients? We need our patients to communicate more and more – we need that feedback, positive or negative. They can help us identify where we need to improve, to grow, to innovate. If they walk away grumbling, but we don’t understand their frustration, we can’t get better. The same is expected of the more than 21,000 OSF HealthCare Mission Partners. I’m asking everyone to embrace this mind shift so we can improve, grow and innovate. Our success will be driven by every member of this organization who responds to the needs of patients and their families. This change is happening everywhere and there must be two-way communication with the front lines to not just get it right, but to be successful. This is an opportunity, the permission, if you will, for everyone to be vocal about how we can improve. I challenge you to identify those areas where we can improve, identify solutions and communicate those ideas to your leadership. OSF HealthCare must be excellent and will be excellent. In many aspects we are. But good, even very good, is not good enough. It’s about being excellent. 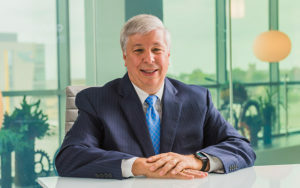 Bob Sehring, as chief executive officer, is leading the transformation of health care at OSF HealthCare to improve the lives of those we serve. In his nearly 17 years of service, Bob has held a variety of leadership roles. His favorite role is that of husband, father and grandfather.